In that case now I am on the 3db, could I still request uncapping of my upstream without it compromising the downstream, summing up what the CSC analyst stated earlier, take from downstream to add to upstream. The BT speedtester result could just be wrong, but I would be interested in seeing the ADSL sync speeds and stats, and also the Plusnet Current Line Speed. have you dropped speed again? It is clear what my achievable speeds are from the http://www.speedtest.btwholesale.com/ screenshots. I know that BT checker keeps saying about the max achievable being 21Mbps but no matter what bt or plusnet do you realy are not going to see much more speed if any at all and defo wont see 21Mbps with the line stats you posted. The max speed i could ever get when i was with o2 was 17Mbps with a 3db setting but the main diff for me is i had a lower attenuation of 24.3DB, Now seeing as yours is like 48ish your lucky to get the speed you do. There are people with the same sort of stats as yourself but they get a much lower speeds. I also would not see any speed improvment if i had left o2 and went to another adsl2+ service. If you was to change isp at this stage i realy do not think any of them could offer you faster inless its virgin cable or fibre. I hope this post don't come across as being funny as i am only trying to explain my understanding of how this stuff works and i hope you get things sorted. Because the plusnet "Current Line Speed" is set far higher than the IP profile, the throughput measured by speedtest results etc. will be slightly higher than what it would be when the Plusnet current line speed gets set to match the IP profile. uncapping of my upstream without it compromising the downstream, summing up what the CSC analyst stated earlier, take from downstream to add to upstream. Uncapping the upstream does not take anything from the downstream. The available tones for the upstream and downstream remain the same whether the upstream is capped or uncapped. Uncapping the upstream is not the same as Annex M. Annex M does take from the downstream to add to the upstream. I don't think that makes any sense whatsoever. Why would interleaving "create more errored seconds", or why would your line be to long to handle interleaving, when your line is the same length as with your previous ISP which did use interleaving? Just ignore the "max achievable speed" and "acceptable range of speeds" from the BT speedtester. The "max achievable speed" doesn't mean or imply anything, it doesn't mean your line has been capped to that speed, and the "acceptable range of speeds" is just BTWholesale having very low targets for acceptable throughput speeds, but everyone expects to get their full line speed all the time anyway. Why do big companies lie to get the sale(s) then don't give a monkeys cos you have above 5Mbps connection on ADSL2+ even after proving the line is more than capable of handling the speeds I as previously getting. @TORPC - I've had to skim back through the rest of this thread to find frequent references to "previous ISP" without you actually mentioning who it was, however, as I suspected, you appear to be saying you were with a LLU supplier. LLU suppliers with their own equipment in the exchange do not have the BT IP Profile system to contend with, and therefore can get a little higher throughput. Kitz has an explanation (kind of) here. If you enter your downstream attenuation and click Calculate, you will see that the "BT 21CN WBC & ADSL2+" and "ADSL2+ LLU" throughput figures differ by a small amount. 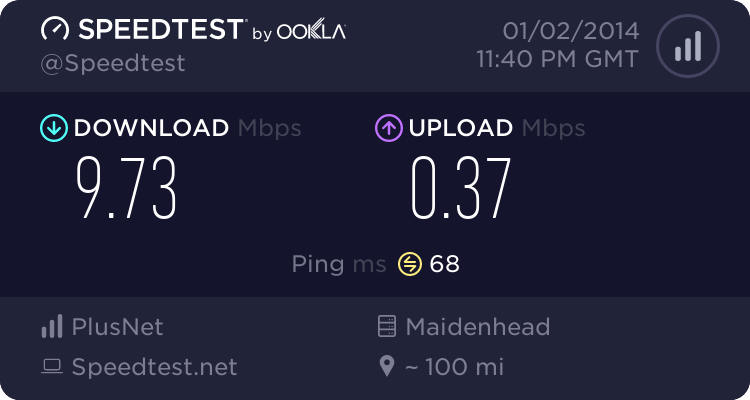 If you haven't already had your upstream uncapped, I can happily recommend you go for it - the improvement in the "feel" of your connection will be noticeable. I am getting confused here by all the numbers being thrown around. It seems to me that 9.73 is faster than 9.10, so what exactly is the issue here? Sure, the upload speed is lower but that is because of PNs stupid 448k upload cap - removing it is unlikely to decrease your download speed. Also, why not share previous provider?